The cable chatter about Scott Brown’s surprise – to everyone but Massachusetts voters – victory in the US Senate race to succeed Edward M. Kennedy focused primarily on how it might affect the debate on Health Reform in the United States. Sixty Democratic Senate votes in favor had become fifty-nine, and in the math of the United States Senate, this meant that under frequently used procedures, the Republican caucus could finally kill any attempts to pass a bill. Moreover, the talking heads suggested that voters in the Bay State had offered a public opinion thumbs-down on the product of Washington’s deliberations. From elections in Virginia to New Jersey, and now Massachusetts, Republicans were reviving. 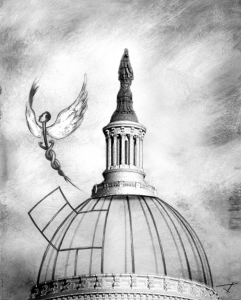 Incredibly, following the 1993-94 script, Health Reform was about to inflict defeat on a second Democratic administration. To many on the Democratic side, it was time to change the subject. But wait a minute. Inside the polling data was a more subtle message. No doubt, opinion was mixed to negative, in some polls even strongly negative, on the results of Congressional action. But inside the specifics, significant majorities – not only of Democrats, but Independents and even Republicans – favored reforming the practices of health insurance companies that allow them to avoid coverage of sick people, favored creating health insurance exchanges, were in support of closing the Medicare prescription drug “doughnut hole,” providing tax credits to small business, and increasing insurance pools for high risk individuals. What’s going on here? In a world of focused messages and instant expectation, it is important to remember that Congress represents, however imperfectly, the complexity, the diversity, and even simply the size of America. The House, based on population, faces voters every two years. The Senate, two votes per state, big and small alike, faces voters less frequently. And the Senate now requires a sixty vote super majority for virtually all business. And yet, facing multiple committee jurisdictions and never far removed from special interest influences, both Houses of Congress, amazingly and indeed historically, did pass significant reform bills. But the price of process was high. Time and momentum had been wasted. Indefensible personal deals had been struck. Moreover, the leaders of the Congress, both Democrats and Republicans, elevated to their roles because of their skill inside their institutions, had become the public faces of the issue. And large segments of the electorate, fearful in a faltering economy and reminded daily of the uneven distribution of opportunity, wealth and power in the nation, were driven in their frustrations to the negative side of the polls on Congressional Health Reform. But maybe it’s the “Congressional” more than the “Health Reform” that they really didn’t like. Inside the Obama White House the answer couldn’t have been more important. While never putting his name on a specific bill, the President had identified Health Reform as central to his vision of future economic security. They were almost there. Throughout late December of 2009 and early January 2010, Congressional leaders convened at the White House, with the President at the table to work out an agreed-upon version of a House and Senate bill. Chances are this would have succeeded. And then, Scott Brown. Some Democrats, taking the simplest reading of the Brown victory were ready to bolt, but others said, “Wait, there’s a different way to get this done. We don’t need sixty Senate votes if the House passes the already approved Senate bill.” Both Houses could also pass agreed-upon amendments under budget reconciliation rules which require only a simple majority vote. Senate rules stipulate that only financial issues, increased or decreased spending, can be passed under reconciliation, but that may be enough to get an agreement. This appears to be the direction in which the President is leading his party and the nation.